The offer of electric cars is becoming more and more important, how can customers make their choice ? At the opening of ChangeForWatt, 20 electric cars were ready to be compared: Renault Zoé and Twizy, Nissan Leaf 1 and 2, Citroën C-Zero and e-Méhari and e-Berlingo Multispace, Smart Fortwo, Tesla Model S and Model X, Kia Soul EV, Hyundai Ioniq, BMW i3, Volkswagen e-Golf and e-Up! 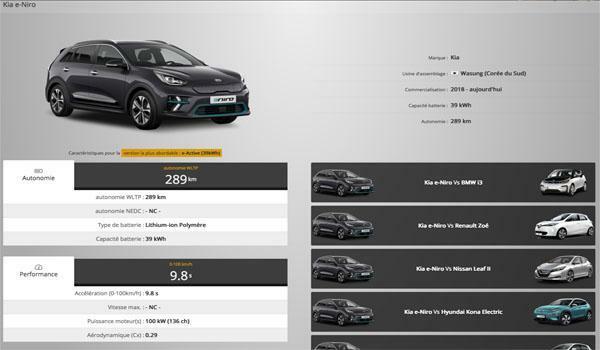 The Bolloré BlueCar and BlueSummer have joined this list, and 3 brand new models: Tesla Model 3, Hyundai Kona Electric and Kia e-Niro. A total of 25 trendy models representing almost the entire range of electric passenger cars in France.